Pouch 7001 (555 Cordova) Olympic Bldg. Holy Assumption Orthodox Church ca. 1900, courtesy Anchorage Museum of History and Art. The Holy Assumption Orthodox Church National Historic Landmark is on the east shore of Cook Inlet, 165 miles southwest of Anchorage. The site consists of the Church, the rectory, and a chapel. All are on what is known as the Russian Mission Reserve, 13.47 acres, composed of two irregularly-shaped lots. The larger of the two, 12.04 acres, is a cemetery. A narrow corridor connects it to the other lot, 1.43 acres, on which the church, chapel, and rectory are located. At one time, another associated building, the Russian school, was also on the smaller lot. The City of Kenai erected the Fort Kenai Museum, of logs, in 1967, on the site of the schoolhouse, leasing the land from the church. The site itself is southwest of the town of Kenai on the Kenai Peninsula in southcentral Alaska. Kenai is the principal town of the Kenai Borough. The Kenai Orthodox parish encompasses the Kenai peninsula as far south as English Bay and as far north as Tyonek, some 400 square miles and includes four chapels. 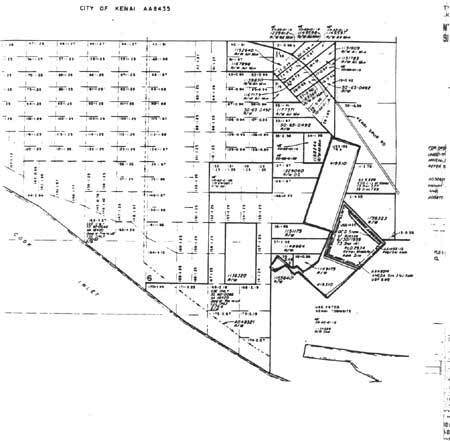 The community which has responsibility for the buildings on the site is the local Kenai city Orthodox population which numbers only 130 adults, drawn mainly from the Kenaitze Indians. The new Kenai temple is constructed in the shape of a ship, of logs,... with a capacity of 80 persons, with an ikonostas. On the ikonostas and on the Royal Doors are new ikons, acquired in part through donations of $100 from the local Brotherhood. The walls of the temple are wall-papered and the ceiling is painted with oil[-based] paint. The porch [narthex] is divided into two small rooms: one designated as a vestry, the other as an archives and for church supplies. The [exterior] walls are not yet sided [neobshity]; the roof is shingled [cherepitsei] and painted with oil[-based] paint. There is no bell tower, but the bells (3) hang from a beam under a portico [naves] built over the entrance door to the narthex [papert]. The construction of the church and the ikonostas was accomplished in part by means of funds from the local church and generous [dobrokhotnyi] donations within the Kenai parish and in part through funds from the Alaska Ecclesiastical Consistory..... The old church is being used temporarily as a school. The Church/Clergy Register (Klirovaia vedomost') for 1903 reported that the bell-tower and the fence around the church were both completed in 1900. An early photograph, ca. 1905-1910, shows the church covered with white-washed siding, and with a two-story addition to the front, topped by an octagonal belfry with eight semi-circular windows and a cupola and cross (fig. 1). The addition also considerably enlarged the porch, or narthex. 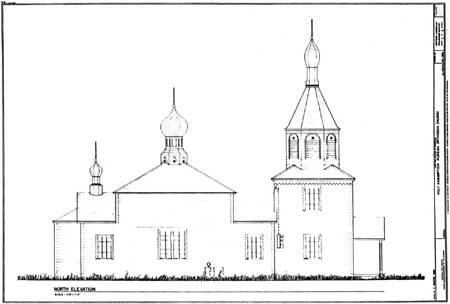 and by providing the bell-tower, added an element without which no Orthodox church was considered complete. 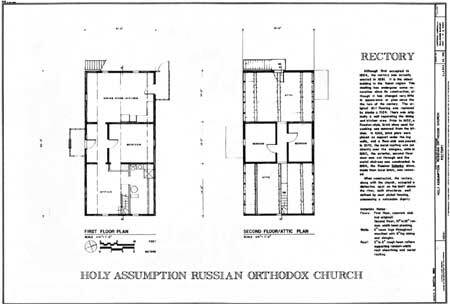 The design of the Holy Assumption Orthodox Church is a common rural Russian plan, being rectangular with a semi-hexagonal apse (see attached architect's drawings for renovation work in 1978, and fig. 2). The church is built on an east-west axis, with the altar at the east end and a small porch with a gable roof on the west end (figs. 3 and 4). The building is covered with clapboard siding, painted white, and has brown trim around the windows and door, along the exterior corners, and outlining the center of the nave. At the west end of the church is the square (15 feet x 15 feet) two-story bell-tower, with a decorative saw-tooth wooden molding painted blue, at the eaves. The pyramidal roof-line of the tower is broken by an octagonal belfry, with eight windows with semi-circular arches. Each of the panels of the octagon and the windows themselves are outlined in brown paint; the panels have a blue star within each semi-circle. Louvers are used in the windows. Atop the belfry is an octagonal roof of wood shingles, the eaves of this roof forming a lip which extends well out over the belfry, again a common Russian design. The point of the roof culminates in a narrow collar with a drum-like-vertical extension; both are of wood and hold the slender flame-shaped cupola of metal sheeting. The collar and cupola are painted blue, while the drum is white. On the north and south elevations the nave is distinguished from the bell-tower and the apse by vertical trim on the east and west ends. The central portion of the nave has walls 18 feet high by 29 feet long; it has a pyramidal roof of wood shingles. The nave, like the tower, is topped by a four-sided pyramidal roof, broken by a cupola, this one in an onion shape (fig. 5). The drum holding the cupola is decorated with vertical rectangular panels painted blue and the collar has a molding which forms a triangle design, with a star in each of the eight triangles. 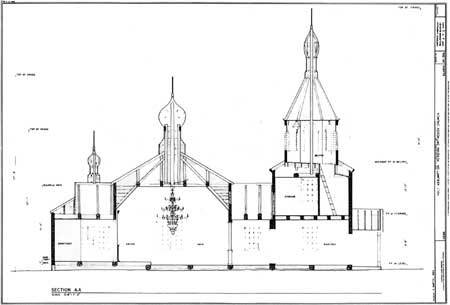 The nave is joined to the tower and the apse by 12 foot walls, and a 6 foot hip roof extension, abutting the bell tower in the west and forming a gable roof over the apse in the east. At the east end of the church over the entrance to the altar area, on the hip roof, is a third cupola and cross (fig. 6). In this case, the collar and drum are painted white, the onion dome itself corresponding to the dome over the nave. A gold-painted metal three-bar Orthodox cross is atop each of the cupolas. The apse, containing the altar, also has walls which are 12 feet high; its two side walls are 6 feet wide; the back wall is 10 feet 4 inches. The corners of the apse have brown trim. The shingled roof of the apse, being three sides of a pyramid, echoes the shape of the roofs of both the tower and the nave. There are five windows on the north and south sides of the church, four on the first story, and one on the second story of the tower. The window in the center of the nave is a set of two vertical twelve-light sashes. The others on the first floor are double-sash, six-over-six light. The vertical windows consist of four of the six-over-six turned sideways. The window on the second floor is smaller, but also double-sash, twelve light. The shingle roof is painted light green. The over-all dimensions of the church are 65 feet 9 inches long (including the front porch) by 23 feet 6 inches wide by 44 feet high. Since 1900, only minor changes have been made to the basic structure of this classic Russian-style village church. The modifications to the exterior have been to the bell-tower itself, as various solutions were sought to control the damage of snow and rain while providing for the ringing of the bells. Early photographs show that the windows in the bell-tower were unglazed and uncovered (fig. 1). A later photograph, in 1919, shows one uncovered window, while the others appear boarded up and painted white (fig. 7). In 1949, these windows again appear unglazed and uncovered (fig. 8), but in 1961, double-sash windows with four lights up and down are in evidence (fig. 9). At present, louvers are used in all eight windows. Early photographs of the church also indicate that a painted molding was used to further delineate the nave, trisecting the walls, with the peak of the triangle on a line below the cupola. Aside from these minor modifications, the church on the outside looks today much as it did in 1905. 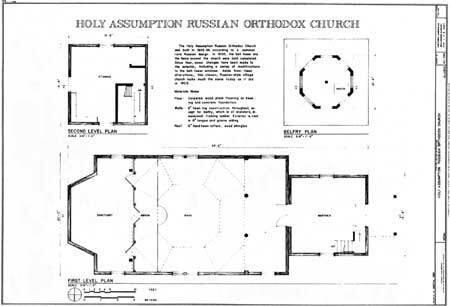 The interior of the church reflects the exterior, that is, the simple rectilinear design is apparent as one enters the narthex, or pre-dvor (before the doors) in the Orthodox terminology. The full church is visible from the entrance, if the Royal Doors in the center of the ikonostasis are open. The narthex is the first story of the bell-tower and is 15 feet x 15 feet x 12 feet. 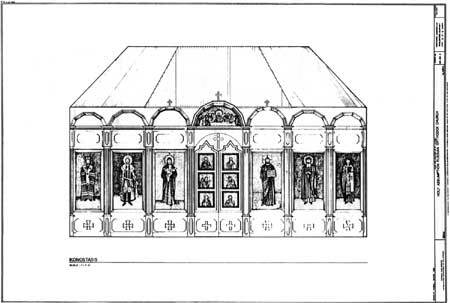 Beyond a pair of French doors is the nave; on a one-step platform (the amvon) on the eastern end of the nave is the ikonostasis which bisects the room. Behind the ikonostasis is the altar area, or sanctuary. Returning to the narthex, on its north wall is a five-step ladder-like stairway to a lockable, insulated door which provides access to the bell-tower and the second story. Beneath the stair is a storage closet. The narthex, like the rest of the interior, is sheathed in sheet rock which is painted white. Tongue-in-groove beaded boards, which are painted blue, are used for both the ceiling and wainscoting in this room and in the nave and are original to the church. Only in the sanctuary is there no wainscoting. French doors, which are original to the building, lead to the nave (fig. 10). Each door has four lights and two wood panels. Two round wood columns, on wooden plinths, support the beams which mark the elevated portion of the nave. Ornate brass wall lanterns are on the west wall on either side of the French doors (fig. 11). These fixtures as well as the brass chandelier (fig. 12), date from the turn of the century. In an early effort at beautification, these brass fixtures were painted gold. The first tier of the ceiling is octagonal, each side defined by molding; a brace at each corner of the nave has been used to support four of the sides. The panels create the illusion of a dome, although the upper ceiling itself is flat; both sections of the ceiling are painted light blue (fig. 13). Four spotlights on the ceiling illuminate the ikon stand in the center of the nave as well as the ikonostasis. The latter is in need of restoration although the ikons have been reinforced from behind with plywood. The ikons on the ikonostasis, in the sanctuary and on the walls surrounding the screen are original to the church and several may pre-date it. The Royal Doors in the center contain ikons of the four evangelists and of the Annunciation (fig. 14). To the right (south) of the doors, there are three large ikons: Christ the Saviour, St. Sergius of Radonezh (on the deacon's door), and St. Nicholas. On the south wall of the nave, immediately west of the ikon screen, is a large ikon of the Resurrection. To the left (north) of the Royal Doors are three large ikons: the Mother of God (Theotokos), St. Alexander Nevsky (on the other deacon's door), and St Innocent of Irkutsk. The ikon of this church, the Assumption of the Virgin, is on the south wall of the nave next to the ikonostasis. Above the Royal Doors is a particularly fine ikon of the Last Supper (fig. 15). The ikons are of good quality, in 19th century style, but all are soiled by smoke from the candles and censor. Under the north window in the nave is a case containing several historic items, particular to the church. Among these are antique Royal Crowns used in weddings, several small ikons with silver rizas (coverings), and a spike from the original Cathedral in Sitka. The church also possesses the original document creating the Kenai parish, signed by Bishop Innocent in 1849; it is framed but not displayed. The altar room, east of the ikonostasis, contains several old ikons, which also are soiled by smoke from candles (figs. 16 and 17). On the south wall of the sanctuary is a window, the only one in the church which opens. East of it is a small glass-front wall-cabinet, used to store utensils for the service. The walls of this room are white plaster board; the ceiling of tongue-in-groove beaded boards, is painted light blue. The furnishings of the room include the altar, the Table of Oblations, and the Plashchinitza (a tomb-like structure on which is laid an ikon on cloth of Christ; it is used only on Good Friday). The second story of the church is reached by means of the stairway from the narthex. A landing midway contains a ladder to the belfry. The bells are believed to be the same ones installed in 1900 (fig. 18). The second story of the belltower is a storage chamber, containing paraphernalia used in church services throughout the year. There are also a number of significant historic items. Two original built-in floor-to-ceiling wood cabinets with shelves house these items. The cabinet on the west wall contains brocade vestments, most of which are antique and used only once a year; one of them bears the name Pamfilov and the date 1901 (fig. 19). The cabinet on the south wall contains a number of historic documents, in journals: records of vital statistics (Metricheskii Knigi) from 1922 to 1968, synopses of correspondence from 1893-1919, records of the Brotherhood (1905-1918) and the Temperance Society (1906-1907), Registers of Confessions (1911-1945), and accounting records (1906-1943). Wall shelves in this room contain liturgical and Sunday-school materials, no longer in use, for other churches and chapels in the parish (fig. 20). There also are 41 copies of an Aleut Gospel of St. Matthew. A door on the east side of this second-story room opens into a smaller, low-roofed storage chamber, which is formed from the gable on the west extension of the nave. This room has not been modified and the exposed hand-hewn logs clearly show the underlying structure of the church (fig. 21). The insulation on the floor between the beams is a styro-foam pebble compound over visqueen; the roof logs have not been insulated. An opening on the east wall of this small chamber has been filled with insulation (fig. 22). In 1978-1979, Historic Preservation Funds were used to rehabilitate the building and to repair damage from weathering and inadequate maintenance (figs. 23, 24). Exterior work included repair and/or replacement of deterioriated items such as belfry panels, the right front door and the sill, wood shingles, and the front steps. Louvers were placed in the belfry windows. Work yet to be done includes some roof shingle repair and repair to the cupolas over the nave and the altar. A picket fence also is to be replaced around the church. In the interior, rehabilitation included structural stabilization, insulation, and weatherproofing, as well as repair and refurbishing of surfaces. The walls were stripped back to the underlying logs, removing twelve layers of wallpaper in the process (fig. 25). The logs, which were dovetailed, were found to be in excellent condition, but some additional support was provided on the inside walls. A vapor barrier was installed and the building was insulated with fiberglass. The walls were covered with plasterboard and painted white. Woodwork was sanded, patched, and painted. The windows were caulked and glass replaced. Thermo-pane glass was inserted in each sash on the inside of the existing windows, so as to retain the original window appearance; the exception is in the tower where the windows have not had thermo-panes added. The electrical system was brought up to code and new boxes installed. Spotlights were placed in the ceiling both in the nave and in the altar area. Baseboard electric heating was installed, replacing an oil stove. This solution to an old problem, unfortunately, deposits dirt along the wall above each heater. The major work remaining to be done on the interior includes restoration of the ikon screen to its original appearance, cleaning of the ikons, removal of gold paint on the brass chandelier and wall-lamps. The most noticeable difference between the church prior to rehabilitation in 1978 and the present is the absence of wallpaper in the current building (figs. 26, 27). The church today appears in good condition and is pleasing to the eye, but it lacks the intimate quality provided by the floral wallpaper which covered both the nave and the sanctuary. The church committee still hopes to be able to wallpaper the church and to restore the ikonostasis and the brass fixtures in the near future. 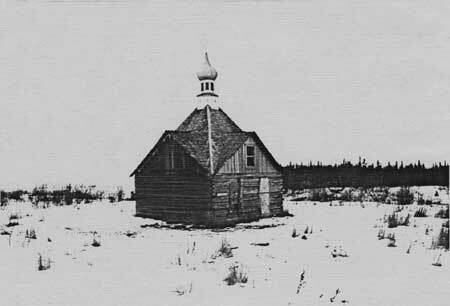 The Chapel of St. Nicholas was built in 1906, and rests over three graves, those of Igumen (or, Abbot) Nikolai, first missionary in the Kenai area, his assistant and reader, Makarii Ivanov, and another monk whose name is not recorded. There are no other graves at this site. It is customary for priests and elders of the church to be buried in the church yard. 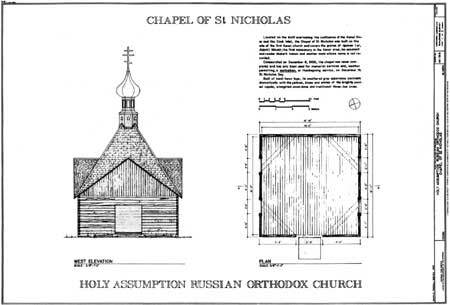 As Igumen Nikolai died in 1867, during the time of the first church in Kenai, the chapel is, then, on the site of this first church, and also, therefore, on the site of the original Russian Fort St. Nicholas. The chapel is used for memorial services, and when weather permits, the priest holds a moleiben, or Thanksgiving service, in the chapel on December 19, St. Nicholas Day. Among the chapels constructed [in 1906] the one in Kenai deserves special attention. This chapel was built through the zeal of Kenai residents, although donations were contributed from other places. It was dedicated to the name of St. Nikolai and is located near the Kenai church on the grave of Igumen Nikolai, the first missionary to the Kenaitsi; it is on the very spot of the altar of the first Kenai church. The dimensions of the chapel are 20'x20'x15' high. Due to a shortage of funds, the chapel is still not well decorated, but in its present condition, it cost as much as $300. The chapel was consecrated on December 6, 1906. The chapel commands attention on the bluff overlooking the confluence of the Kenai River and Cook Inlet (figs. 28, 29, 30). It is built of hand-hewn logs, their weathered appearance in marked contrast to the freshly painted cupola at the peak of the roof. The building is almost square with dove-tailed corners, many of which are still very tight (fig. 31). There are two 2 feet x 3 feet windows in the north and south walls, three of which are boarded. The entry, having neither door nor jamb, is on the west. The chapel rests on concrete blocks which are several inches above the ground. A concrete slab provides a front step. 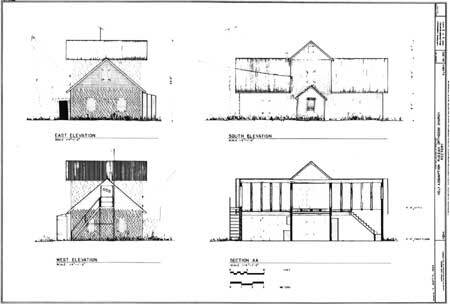 A gable projects from each side of a pyramidal roof; those on the north, south, and east sides have 2 feet x 3 feet windows which are now boarded up (fig. 32). The roof is of sawn wood shingles, with a 5-6 inch reveal; the ridges are flashed with a 5 inch metal strip. The cupola is a dramatic counterpoint in texture, color, and design to the wooden walls and roof (fig. 33). It is comprised at its base of an octagonal collar of perhaps two feet in height, which is painted white and embossed with a blue star on each side. Around the overhang between the collar and the drum is a dentil trim which has some of the "teeth" missing; it too is painted blue. Above the collar is a round drum with eight panel inserts painted dark blue, framed in light blue. The dome is an elongated onion shape of sheet metal, also painted blue, with the three-bar cross over all. The cupola echoes design and decorative elements in the church cupolas, which are visible 400 feet to the northeast. As there is neither ceiling nor covering over the walls, the structure of the chapel is clearly visible. The logs are hewn flat on the inner and outer edges and are notched on the underside where they are stacked one on another. Moss has been stuffed into the small cavity thus created. This technique is most visible in the doorway as neither door nor jamb remain (fig. 34). At several points on the walls, spaces between the logs show wooden dowels which were used to secure the walls (fig. 35). The roof is supported by rafter logs (6-3 inch taper) on approximately 4 feet centers (fig. 36, 37). All four corner hip rafters meet at the top to support a single post inside the cupola (fig. 38). The rafters are sheathed with 1" rough sawn lumber boards spaced 2-5 inches apart. The gables are supported by ledger rafters nailed to sheathing; the rafters at the outside end of the gable support both tongue-and-groove siding (set vertically) and sheathing boards. The chapel is empty, having no permanent furnishings. Its only light comes from the doorway and one window from which the boards have been removed. 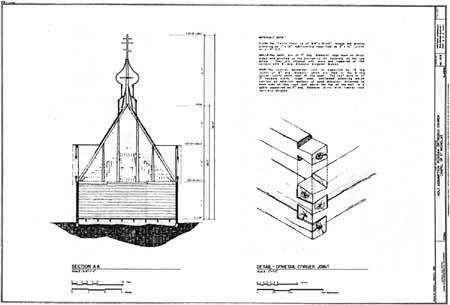 In 1973, the Kenai Historical Society replaced the log supports beneath the chapel with the cement blocks which are there now. At that time, the crosses which lie flat on the ground over the graves were replaced over visqueen in hope of reducing the progress of decay. Efforts by the Society to keep glass in the windows and a door hung have been unavailing, even plexi-glass falling to vandals. In 1978 the cross was blown off the cupola. In 1980 it was replaced using a metal stem which fits down into the cupola. This eliminates the need for guy wires which previously were necessary for stabilization. At the same time, the cupola was painted with an epoxy-type paint. The rectory attached to the Holy Assumption Orthodox Church is north of the church, directly across Mission Street (fig. 39). Although first inhabited in 1894, it was actually erected in 1881 (fig 40), which would make it the oldest building in the Kenai region. The house consists of a two-story center section with two one and one-half story wings (fig. 41). It is 40 feet long (east to west) by 21 feet wide (north to south) and is constructed of hand-hewn redwood logs, joined with squared-notch corners. These are covered on the exterior by wood shingle siding, except as noted below. At one time the rear portions of the wings had attached sheds, each of which has been removed (fig. 42). On the northwest (rear of the kitchen) side, the original logs have been covered by board and batten and a covered entryway, also of board and batten, has been added. On the back side of the northeast wing, the original logs have been revealed; a fragment of newspaper still clinging to these logs bears the date 1896. The former doorway into this shed from the house is covered on the exterior by boards and on the interior (now the bathroom) by sheetrock and marlite. On the front of the house a covered entry, which is 7 feet wide, extends four feet out from the center section. The gabled roof of the house itself extends north to south on the center portion and east to west on the wings and is covered by corrugated tin over wood shingles. Shiplap siding is used under the gables. There is a fire-escape on the west end of the house, from a second-floor exterior doorway (formerly a window). There are seven single-light windows on the first story, two on each elevation except the north, which has one window serving the master bedroom. There is a single-light window on the second floor under each gable. There is also a window, now boarded up, on the south wall of the entry porch, and a small boarded-up vent at the roof line under the south gable of the house. The interior floor plan of the rectory is nearly the same as it was at the turn of the century, according to the recollections of a local resident who lived in the house from 1914 to 1932. The center section on the first floor is taken up by the entry and the master bedroom. The kitchen-dining room is west of the entry (fig. 43), a living room (or study) is to the east (fig. 44), and north of the living room-study is the bathroom, which was at one time a study-bedroom. The original plasterboard walls on this floor have been preserved. The second floor is approached by a simple stairway from the living room-study which emerges in the east gable of the partially finished second story. There are now two bedrooms in the north and south gables. The exterior walls of the east and west gable "rooms" recently have been insulated, but otherwise this story reveals the original construction materials of the house. A narrow walkway over the original ceiling joists runs from the east gable to the door in the west gable which leads to the fire-escape; the bead-board ceiling of the first story is exposed below the joists. The same boards are used on the walls of a passageway which runs east to west through the central part of the second floor (fig. 45). The log walls are unchanged on the east and west interior walls; moss chinking and old Russian square-headed nails used as pegs are still in evidence. in 1984, the Russian Galanka stove, made of local bricks, was removed. It was original to the house and had been its source of heat. It had occupied the space between the master bedroom and the living room, but had been out of use for many years. In its place, a wall was constructed, with a closet on the bedroom side and bookshelves on the living room-study side. Also at this time, the bathroom-laundry room was replumbed and marlite was put over the plasterboard and sheetrock over the board ceiling. The general appearance of the rectory, particularly on the outside, reflects both inadequate maintenance and routine upkeep. The metal roof of the rectory appears out of place, and does not seem to fit the roof itself very well. The building is badly in need of paint, and many shingles need replacement. Nonetheless, several features of the house recall its period of construction, when it was the most substantial residence in the region. The present priest and the church council have made an effort to retain significant elements of the historical features of the structure, including the original floor plan. The building has the original ceiling beams and boards on the first story, except in the bathroom, as described above (fig. 46). Two-inch holes, bored through the logs to the outside, are still in use for ventilation as the windows do not open. The front and back doors are quite old, although possibly not original to the house; they are paneled, with four lights in the upper half and are badly worn and damaged in places. The priest would like to retain these if they could be restored. As noted above, the second story has been preserved with only minor maintenance alterations, except for the addition of the exterior door on the west end and interior doors on the two upstairs rooms in the east and west gables, to create bedrooms. Turning to the immediate vicinity of the house, there is no fence as there once was around this property, and the yard has not had any recent attention. The structure is now flanked on the west side by a trailer and another temporary building, both used for storage by the family (fig. 47). On the east side is the modern log two-story building of the Fort Kenay Museum, in the location of the old Russian school. Because of their temporary nature, the storage sheds do not diminish the historical integrity of the site. The Museum, also on the historic site, contains exhibits which pertain to the period; it therefore, does not diminish the integrity of the site. The major changes to the church and its associated buildings on the site do not concern the structures, which are remarkably well-preserved in their basic integrity, but relate to the site and its surroundings. When built, the rectory and the church occupied a distinctive spot on the bluff above the river, both structures well-defined by neat picket fencing, possessing a noticeable dignity. Although not physically removed from the life of the community, log houses being around them, they enjoyed a harmony of design with their surroundings. The fences around the rectory and the church are gone; the yards have not been well-maintained. The distinction of the rectory, in particular, has been obscured both by its nearby non-historic structures, although several of these are not permanent, and also by its metal roof. Fortunately, a number of fine trees have grown up around the church, helping it to retain a certain distinction with respect to its surroundings. A major four-lane highway (the Kenai Spur Highway) is but two blocks away, and is on the northeast edge of the cemetery. A 12-foot fragment of the northwest edge of the cemetery has been occupied by a trailer court. These intrusions do not, however, destroy the historical integrity of the site. Of the three structures on the site, the chapel most nearly retains the original atmosphere, being set apart from nearby structures, with a low rail fence of logs; the absence of trees immediately around it remind one of the way the church looked in the earliest pictures available, that is, standing somewhat apart on a grassy bluff, having a neat, self-contained appearance. St. Nicholas Chapel, by William Hanable, 1971. The Holy Assumption Orthodox Church has been the principal and most enduring representative of Russian culture in southcentral Alaska from 1841 to the present. For the Kenaitze Indians, who are still a significant portion of the population, it was the major institution for the assimilation of western custom. In particular, it served as an educational, religious, administrative, and judicial center until well into the twentieth century. It also provided the region's first access to public health. The three structures on the site represent classic Russian-style architecture on the far-western frontier. The Church of the Holy Assumption is a fine example of a Russian village church; it is a classic of the Pskov, vessel or ship, design. It is also the oldest standing Orthodox church in Alaska. The rectory is typical of the homes of the Russian village gentry and at the time of its construction was clearly a substantial landmark, being the only two-story structure in the community. 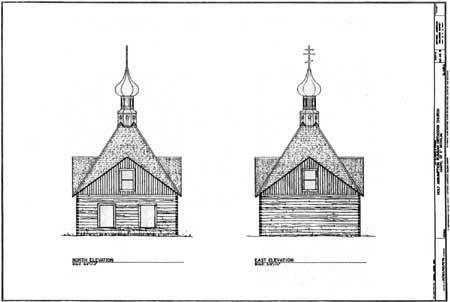 The chapel is an excellent example of Russian techniques of log construction, its uncovered log walls an illustration of the excellent craftsmanship and engineering of the Russian-trained builders of the Kenai peninsula. Kenai, Alaska has a recorded history dating from its founding as Fort St. Nicholas (Nikolaevsky Redoubt) in 1791 by representatives of the Russian fur-trading enterprise, the Lebedev-Lastochin Company.1 This company was one of several which operated in what was once Russia's easternmost frontier, exploring the Aleutians and the coastal waters of the Bering Sea in search of otter pelts. The outpost on the Kenai River was not the first Russian outpost on the mainland, those of Fort Alexandrovsk (present-day English Bay) and Fort St. George (Kasilof) pre-dating it by five years. Nikolaevskii Redoubt, however, assumed a dominant position by the end of the 18th century, and until Alaska was sold in 1867, was the principal Russian community in southcentral Alaska. Early in its history it became known by the name of its local Indian people, the Kenaitze, being called Kenai by both Russians and Americans. In a typical pattern of settlement on the Russian frontier, promysh-lenniki, or fur-traders, were the first to enter a region; they were followed by representatives of the Orthodox church. Although Russians had become active in Alaskan waters in 1741, it was not until 1794 that the first Christian mission was sent from Russia to baptize the natives. A member of this original missionary party, Hieromonk Juvenaly, is known to have spent some time in the Kenai region during 1795-96.2 Following his death in 1797, until the middle of the 19th century, there was no regular Christian servicing of the region. Missionary visits were made every two or three years by the priest based at Kodiak, and occasionally Kenai Orthodox would travel by bidarka to Kodiak to receive the sacraments. In 1840, Alaska became a diocese of the Russian church and for the first time had a resident bishop. 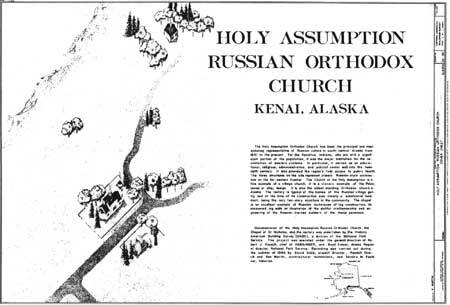 This opened a period of dynamic growth for the Orthodox church in Alaska.3 In 1841 Bishop Innocent (Veniaminov) created six new parishes; Kenai was one of them. In the same year. the Russian-American Company employees built the first chapel at Fort St. Nicholas, dedicating it to the Assumption (into Heaven) of the Virgin Mary (TheotokosMother of God, as she is called by the Orthodox). Services initially were led by a layman, an employee of the Company, A. Kompkoff.4 In 1844 the first priest arrived to live at Kenai and to serve the parish, which eventually included not just the fort and its community but also seven other communities, encompassing several hundred square miles. This individual, Igumen (Abbot) Nicholas, stamped his imprint on the community for many years to come. He served the Kenai parish, and for a time, the neighboring Nushagak River region, from 1844 until his death in 1867. He is buried under the chapel of St. Nicholas which is included in the National Historic Landmark. In 1867, Abbot Nicholas died and in the same year, Russia sold Alaska to the United States. For the next 15 years there was no resident priest at Kenai, and from 1881 to 1896 the priests changed every three to five years. It was clear, nonetheless, that by the 1880's that Kenai was a valuable part of the Orthodox diocese, for from 1881 until 1952, it was not without a priest except for two years between 1886 and 1888. The Orthodox church, therefore, continued as a cultural and social factor in the region, broadening and deepening its contact with the population. For many decades after the United States took responsibility, there was no effective civil order in those parts of Alaska, such as Kenai, which were far from the capitol at Sitka and after 1900 at Juneau. Schools were not established by Protestant and Roman Catholic missionaries until the 1890's and public schools did not become a factor until the early 20th century. The Russian school in Kenai and the schools under its aegis in the villages were the principal avenue for advancement for native children. Many of the graduates of the Kenai school went on to higher education at the Seminary in Sitka or San Francisco and returned as readers, teachers, and priests in Alaska. Among these was Alexis Ivanov, the son of the reader at Kenai, who went to the San Francisco Cathedral School for training and returned to Kenai, both as teacher and church official.10 Girls were included in the classes, receiving the general education in Russian, Slavonic (used in church services) Church law, mathematics, geography, and after 1867, English.11 The Russian church-supported schools in Kenai were among the most successful in Alaska. At Kodiak, Unalaska, Sitka, and in the interior, Protestant and Catholic schools competed with the Orthodox for students, but the Kenai Orthodox were unchallenged. Abbot Nikita (Marchenko), arrived in Kenai in 1881, the first resident priest in fifteen years. During his five-year tenure at Kenai, he repaired the old church, and began work on a new parish residence.16 This house was built on the instruction of then Bishop Nestor (Zass), who was responsible for the building of a number of churches and rectories throughout the diocese.17 He had commissioned a San Francisco architectural firm to draw up a set of plans for a church house, designed for family living (as Orthodox priests must be married unless, like Abbot Nikita, they are monks). 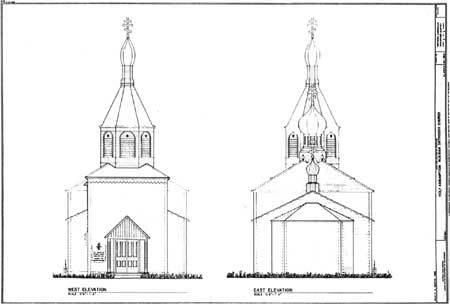 These plans have survived in the church archives and were used as the design of parish houses in Kodiak and at Unalaska, also constructed in the early 1880's. The building erected in 1881 in Kenai has the same general floor plan as the Unalaska house, which also is still standing: a two-story central section with one-and one-half story wings with five rooms on the first floor and two large rooms on the second. 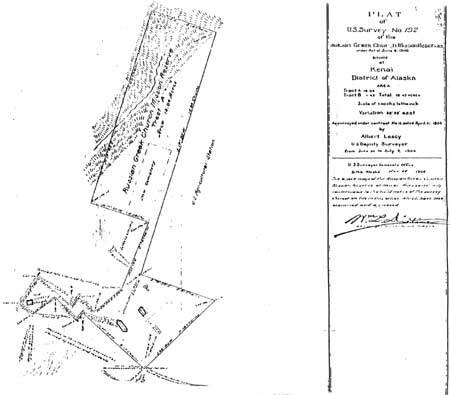 Although proof is lacking, it seems possible that the rectory in Kenai followed the scheme devised by the architectural firm of Mooser and Piser of San Francisco. The building, however, was not finished or inhabited until 1894, due to the death of Bishop Nestor and financial stringencies in the diocese. The church records note that a priest, Alexander Yaroshevich, who served Kenai from 1893-1895, finished the interior of the building and moved his family into it, although he was unable to finish the upstairs.18 This building, begun in 1881, is still occupied by priests of the Holy Assumption Orthodox Church and their families. The period from 1896 to 1908 was an active one in the history of the parish, Father Ioann Bortnovsky being an energetic missionary. During 1897-98, he spent from November to March in the tiny village of Knik, in an effort to convert the Indians of the Copper River region who came to the village to trade, but were otherwise inaccessible.24 The Brotherhood and the Temperance Society were started during his tenure. And it was also during this time that the community built both the bell-tower and the chapel, the latter as a memorial to the founding priest of the parish, Abbot Nicholas.25 The Brotherhood participated actively in the building of the chapel and the church, supplying both labor and materials and buying ikons from their treasury. Father Ioann continued the school as well and in 1898 built a one and one-half story structure to house it.26 By 1900 there were five schools in the Kenai parish, all under the aegis of the Kenai church.27 Thus, forty years after the United States had purchased Alaska, it was the Russian government, through its support of the church, which provided education and a number of other social services to the residents of the Kenai peninsula. Reverend Paul Shadura followed Rev. Ioann Bortnovsky and served as priest in the Kenai parish from 1907 until his retirement in 1952. His children still live in the community and provided valuable information about the structures within the National Historic Landmark. Even as late as the mid-20th century, Kenai was not so different from a century before. It was still an Orthodox village, inhabited primarily by descendants of the Kenaitze Indians who had greeted the representatives of the Lebedev-Lastochin Company in 1791. Father Paul had ecclesiastical authority not only for the seven historic communities of the parish but also for the new city of Anchorage, founded in 1917, which did not have its own Orthodox priest until 1967. The 25 years since oil was discovered off Kenai's coastline have wrought enormous change, turning a village into a first-class city. The Orthodox community today is still active although now it is a small minority of the population of 5700. It is still using the facilities built 90 years ago. These buildings are considered a community treasure by the City and Borough of Kenai and receive much interest and support from both its Assembly and the Kenai Historical Society, as the chapel, rectory and Church of the Holy Assumption are the structural reminders of the important Russian era in southcentral Alaska. 1) Svetlana G. Federova, The Russian Population in Alaska and CaliforniaLate 18th Century-1867, trans. and ed. by Richard A. Pierce and Alton S. Donnelly, Materials for the Study of Alaska History, No. 4 (Kingston, Ontario: Limestone Press, 1973), 121-122. 2) Richard A. Pierce, ed., The Russian Orthodox Religious Mission in America, 1794-1837, with Materials Concerning the Life and Works of the Monk German, and Ethnographic Notes by the Hieromonk Gedeon, trans. by Colin Bearne, Materials for the Study of Alaska History, No. 11 (Kingston, Ontario: Limestone Press, 1978), 45. 3) Barbara S. Smith, Russian Orthodoxy in Alaska: A History, Inventory and Analysis of the Church Archives in Alaska with an Annotated Bibliography (Anchorage, Alaska: Alaska Historical Resources, 1980), 5-8. 4) Schnurer, Sister Victoria, "The Russian Experience," in The Native, Russian and American Experiences of the Kenai Area of Alaska, ed. by James C. Hornaday, for the Conference on Kenai Area History, November 7-8, 1974 (Kenai, Alaska, May, 1975), 55. 7) Schnurer, 74, fn. 6, notes that Abbot Nicholas' report for 1859 provides the following ethnographic breakdown for his baptisms to date: 801 Kenaitze, 450 Chugach, 5 Aleuts, 148 Ugalentzi [region of Valdez], and 18 mixed; Federova, p. 278, gives a population figure of 1,099 Kenais for the year 1859. "Three Journals of Abbot Nicholas: 1858-1860, 1862-1863, 1864", Orthodox Alaska, IV, No. 4, 2-7. Joan Townsend, "Journals of 19th century Russian Priests to the Tanaina, Cook Inlet, Alaska," Artic Anthropology, XI (1974), No. I, 1-30. The journals noted above are included here as well. 9) Each priest was required to keep several journals, the Metricheskii knigi, or Metrical Books, being one of them. These included data in chronological order, arranged by event, of births, baptisms, marriages, and deaths. The original documents for Kenai, from 1844 to 1921, are in the Alaska Church Collection at the Library of Congress. The data for Alaska from these books, through 1936 (lacking 1867-1889) has been compiled and published by the Library of Congress along with an index: Index to Baptisms, Marriages and Deaths in the Archives of the Russian Orthodox Greek Catholic Church in Alaska, 1816-1866 (Washington, D. C., Manuscript Division, Library of Congress, 1970); Index... 1890-1899 (1965); Index... 1900-1936 (1964). 11) Ioann Bortnovskii, "Kenaiskaia missiia [The Kenai Mission]," Amerikanskii pravoslavnyni vestnik [Russian Orthodox American Messenger], II, No. 19, pp. 558-559. This journal will be noted hereafter as ROAM. 12) "V Kenai [In Kenai]," ROAM, I (1896), No. 5, 79-80. 13) Ioann Bortnovskii, et al., "Godovoi otchet Kenaiskago Sv. Pokrovskago Bratstva s 1go Oktiabria 1905 g. po 1oe Oktiabria 1906 goda [Annual Report of the Holy Protection Brotherhood from October 1, 1905 to October 1, 1906], ROAM, XI (1907), 193-194. 14) ROAM, X (1906), 230. 15) Quoted in "Old Fort Kenay" by Roman Malach in The Alaska Sportsman, December 1964, 39, cited in Schnurer, 59. 16) Abbot Nikita's diaries are also in the Alaska Church Collection of the Library of Congress. A selection, from his years of service, 1881-1886, has been published in Townsend, 10-14. 17) Holy Assumption Orthodox Church, "Vedomost' o tserkvi nakhodiashcheisia v selenii Kenai vo imia Uspeniia Bozhei Materi [Register of the Church in the village of Kenai in the name of the Assumption of the Mother of God], 1895," Box D285, Alaska Church Collection, Library of Congress, Washington, D. C. Hereafter this document will be referred to as "Kenai Church Register" with the year. 19) Tikhon Shalamov, "Pis'mo v redaktsiiu [Letter to the Editor]," ROAM, I (1897), 496-497. 20) Innokentii (Pustynskii), Bishop, "Nelishniia ukazaniia [Useful Instructions]," ROAM, VIII (1904), 289. 21) Antonii (Dashkevich), Hieromonk, "Po Sitkhinskomy okrugu [Around the Sitka District]," ROAM, V (1901), 61-62, 63. 22) Ioann Bortnovsky, "[The Kenai Mission]," ROAM, II (1898), 530-531. 23) Townsend, "Journals of 19th Century Russian Priests," 14-16. 24) Ioann Bortnovsky, "Zimovka v Knyk [Wintering in Knik]," ROAM, II (1898), 533-538. 25) ROAM, XI (1907), 163. 26) Kenai Church Register... 1903. Antonii (Dashkevich), Hieromonk. "Po Sitkhinskomy okrugu [Around the Sitka District]." Amerikanskii pravoslavnyi vestnik [Russian Orthodox American Messenger]. V (1901), 3:61-62, 63. Bortnovskii, Rev. Ioann. "Godovoi otchet Kenaiskago Sv. Pokrovskago s 1go Oktiabria 1905 g. po 1oe Oktiabria 1906 goda [Annual Report of the Holy Protection Brotherhood from October 1, 1905 to October 1, 1906]. Amerikanskii pravoslavnyi vestnik [Russian Orthodox American Messenger. XI (1907), 10:193-194. ______. "Kenaiskaia missiia" [The Kenai Mission]. Amerikanskii pravoslavnyi vestnik [Russian Orthodox American Messenger]. II (1898), 18:529-533, 19:558-559. ______. "Zimovka v Knyk [Wintering in Knik]." Amerikanskii pravoslavnyi vestnik [Russian Orthodox American Messenger]. II (1898):533-538. Innokentii (Pustynskii), Bishop. "Nelishniia ukazaniia [Useful Instructions]." Amerikanskii pravoslavnyi vestnik [Russian Orthodox American Messenger]. VIII (1904), 15:289. Shalamov, Rev. Tikhon. "Pismo v redaktsiiu" [Letter to the Editor]. Amerikanskii pravoslavnyi vestnik [Russian Orthodox American Messenger]. I (1897), 23:496-497. "V Kenai [In Kenai]." Amerikanskii pravoslavnyi vestnik [Russian Orthodox American Messenger]. I (1896), 5:79-80. Federova, Svetlana G. The Russian Population in Alaska and California, Late 18th Century-1867. Trans. and ed. by Richard A. Pierce and Alton S. Donnelly. Materials for the Study of Alaska History, No. 4. Kingston, Ontario: Limestone Press, 1973. Hornaday, James C., ed. The Native, Russian and American Experiences of the Kenai Area of Alaska. Prepared for the Conference on Kenai Area History, November 7-8, 1974. Kenai, Alaska: Mayor's Committee on History and Tradition, 1975. Pierce, Richard A., ed. The Russian Orthodox Religious Mission in America, 1794-1837, with Materials Concerning the Life and Works of the Monk German, and Ethnographic Notes by Hieromonk Gedeon. Trans. by Colin Bearne. Materials for the Study of Alaska History, No. 11. Kingston, Ontario, Limestone Press, 1978. Smith, Barbara S. Russian Orthodoxy in Alaska: A History, Inventory and Analysis of the Church Archives in Alaska with an Annotated Bibliography. Anchorage, Alaska: Alaska Historical Resources, 1980. Nicholas, Abbot. "Three Journals of Abbot Nicholas: 1858-1860, 1862-1863, 1864." Orthodox Alaska. IV, 4:2-7. Townsend, Joan. "Journals of 19th Century Russian Priests to the Tanaina, Cook Inlet, Alaska." Arctic Anthropology XI (1974), 1:1-30. Washington, D. C. Library of Congress. Manuscripts Division. Alaska Church Collection. Vedomost' o tserkvi... 1895, 1896, 1903, 1921. [Kenai parish church registers for years 1895, 1896, 1903, 1921.] Box D285 and D286. Meeks, Frances. Kenai, Alaska. Interview on June 15, 1984. Shadura, Paul. Kenai, Alaska. Interview on July 2, 1984. Targonsky, Rev. Macarius. Kenai, Alaska. Interview on June 14, 15, 1984. Verbal Boundary Description and Justification. 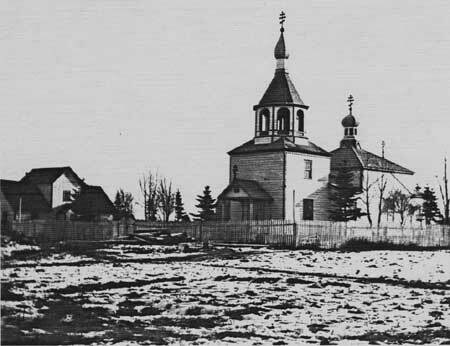 The Church of the Holy Assumption NHL is situated on Tract A of the Russian Greek Church Mission Reserves persuant to Act of Congress, June 6, 1900, and recorded on U.S. Survey No. 192, 1904. 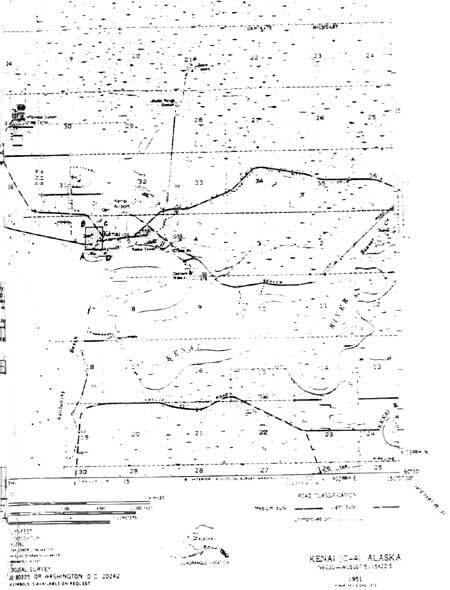 Commencing at corner number 1 as designated on the plat of U.S. Survey No. 192, situate at Kenai District of Alaska; such corner being the point of beginning, thence N. 47° 29' W. a distance of 6.17 chains to corner number 2, thence S. 42° 10' W. a distance of .76 chains to corner number 3, thence N. 40° 52' W. a distance of 2.27 chains to corner number 4, thence S. 54° 03' W. a distance of 2.12 chains to corner number 5, thence N. 50° 15' W. a distance of 1.24 chains to corner number 6, thence N. 34° 30' E. a distance of 2.45 chains to corner number 7, thence S. 48° 32' E. a distance of 3.28 chains to corner number 8, thence N. 42° 45' E. a distance of .79 chains to corner number 9, thence S. 47° 25' E. a distance of 1.62 chains to corner number 10, thence N. 5° 20' E. a distance of 2.72 chains to corner number 11, thence N. 22° 10' E. a distance of 5.30 chains to corner number 12, thence N. 71° 40' W. a distance of 4.54 chains to corner number 13, thence N. 17° 45' E. a distance of 15.9 chains to corner number 14, thence S. 71° 15' E. a distance of 5.14 chains to corner number 15, thence S. 17° 50' W. a distance of 18.94 chains to corner number 16, thence S. 70° 50' E. a distance of 5.91 chains to corner number 17, thence S. 46° 40' W. a distance of 7.39 chains to corner number 1, the point of beginning. The boundaries of the Holy Assumption Orthodox Church National Historic Landmark conform to the historic plat contained in the U. S. Land Survey of 1904. Within the site, there is a modern log structure, which houses the Kenai Museum; it contains pertinent exhibits but is not a historic building. There is also a temporary structure used for storage near the rectory, but it does not have a permanent detrimental effect. These two non-contributing structures do not impair the integrity of the site. See attached U. S. Survey Map, 1904.